featuring specific venues with ongoing musical or theatrical schedules. Annual events involving opera, jazz, cinema, theatre and dance all feature in the calendar as well as a highly popular classical music event in the wintertime. Many of the big hotels and apartment complexes have live entertainment in the evenings featuring Spanish dancing and local musical acts. 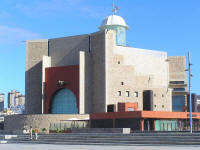 Recently re-opened after a long refurbishment, is the Pérez Galdós Theatre in Las Palmas. Named after the infamous Spanish Realist Novelist, Benito Pérez Galdós, the theatre has under gone a massive face-lift, which included a controversial extension that cleverly combined the rich historical façade with minimalist modern architecture. A new stage and orchestra pit has also been added, which serves to improve the acoustics and provide the musicians with better visibility. 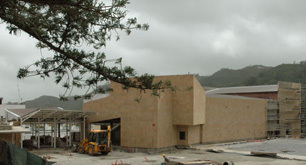 The Pérez Galdós Theatre is at the heart of the Gran Canarian cultural scene and will host some of the best musical events on the island. 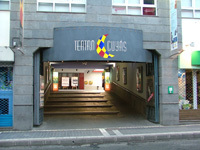 The theatre is situated in the Triana, district of Las Palmas, which is definitely worth visiting; here you can find many notable historical buildings as well as the main shopping street of this area. Visitors can look forward to a slice of true Canarian culture, discover cobbled streets overlooked by characteristic intricately carved wooden balconies, then take a seat in one of the pavement cafes, enjoy a 'café con leche' and watch the world go by. The Concert House of the City also has lecture rooms. 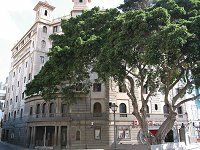 It is a beautiful modernistic building at one end of Las Canteras. La Cicer. Ticket for the different arrangements is bought right here. Panorama picture from Alfredo Kraus Auditorium here. Las Palmas has a extremely excellent and big Philharmonique Orchestra, which gives concerts in the theatre mostly on Fridays. The Festival starts every year in the beginning of January, and continues until the last days of February. 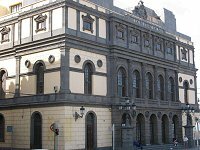 It takes place in the two capitals of the Archipelago, Las Palmas de Gran Canaria and Santa Cruz de Tenerife, where each and every one of the concerts is repeated. In addition to those, there is also a full concerts calendar on each of the smaller islands, Otros Escenarios (Other Venues). Best choice, before, during and after the holiday!